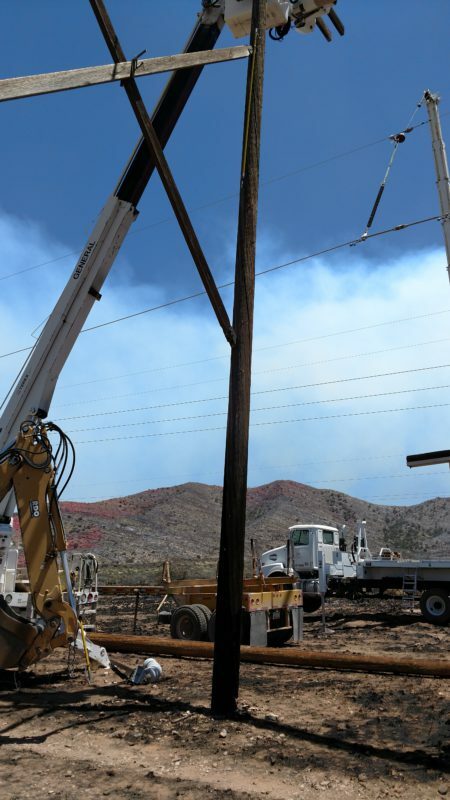 For the second time in only six weeks, a wildfire that grew out of control threatened Arizona G&T Cooperatives transmission lines and put AzGT linemen and system control operators on high alert to maintain system reliability and integrity. 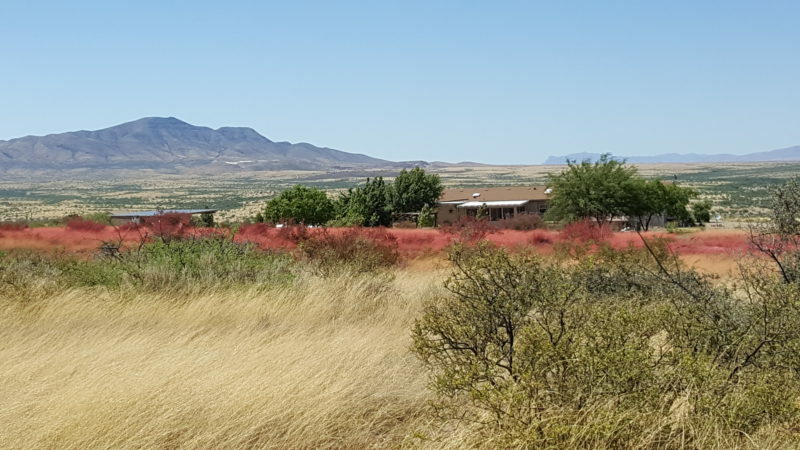 The Lizard fire that was started by lightning in the Dragoon Mountain range was first reported to dispatchers the afternoon of Wednesday, June 7. “We got the first call at about 2:30 p.m., that the fire was in the area but it didn’t look like it was going to be a problem,” said Jimmie Jones, system control manager. Tony Ferraro, hotstick lineman, went out at that time to check the line, and reported back that it was alright and wasn’t being threatened by the fire. In less than 24 hours, that changed. 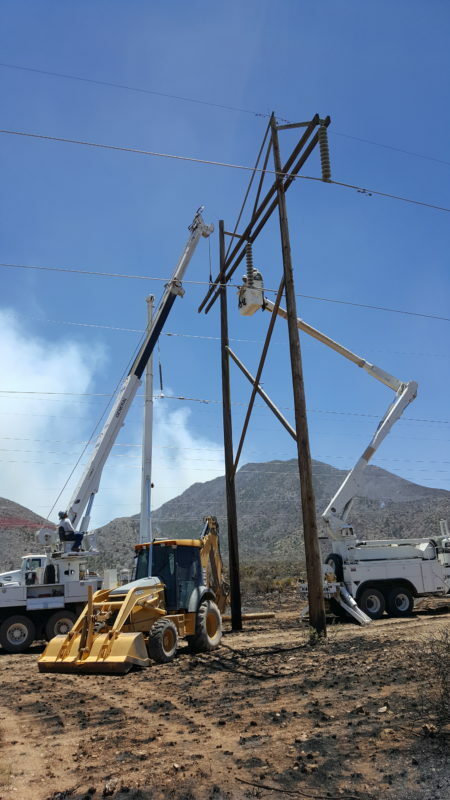 “We got a call Thursday morning from the incident commander that the fire had burned under our Apache-Butterfield 230kV line, and Dave Garcia (line inspector) was sent to check the system, and he reported back that the fire had singed a couple of our poles but they were structurally sound and the fire was moving away. “At that point on Thursday afternoon, we thought there was nothing more to worry about,” Jones said. The fire continued to keep AzGT crews guessing Friday, moving toward, then away from the line. The incident commander called Robert Bray to get the number to system control “just in case” and told Bray that firefighters were waiting for the flames to come off the mountain and onto the flats so they could fight the fire more effectively. On Saturday, that’s what happened, with immediate consequences for the transmission system. The fire was moving quickly toward the line again, and the on-site incident commander called dispatch to have the line taken out of service because fire crews were working under and around it. At 8:23 a.m. the line was de-energized. For almost 24 hours, until firefighters got the upper hand and the line was re-energized at 7:59 a.m. Sunday, the priority was making sure nothing else happened anywhere else on the system. For AzGT linemen, a big challenge was just being allowed in to the burn area to inspect the system. At one point on Saturday, after the line was de-energized, Tony Ferraro had to wait 11 hours in his truck before fire commanders would let him in to access the line right-of-way and look for damage. “When Tony got in, he found one bad pole that was halfway burned but still standing,” said Barry Jackson, transmission line working foreman. It was decided the pole had to be replaced. Brad Stretch, a mechanic, was also called out Saturday, when one of the trucks the linemen were using broke down. Jackson, Ferraro, and hotstick linemen Jason Searle and Henry Patricio made up the crew that went back out at 6:30 a.m. Sunday to start the job. They decided they had to replace it with the line “hot,” or energized, to maintain system reliability. “It took about 10 hours, we finished at about 5 p.m.,” Jackson said. 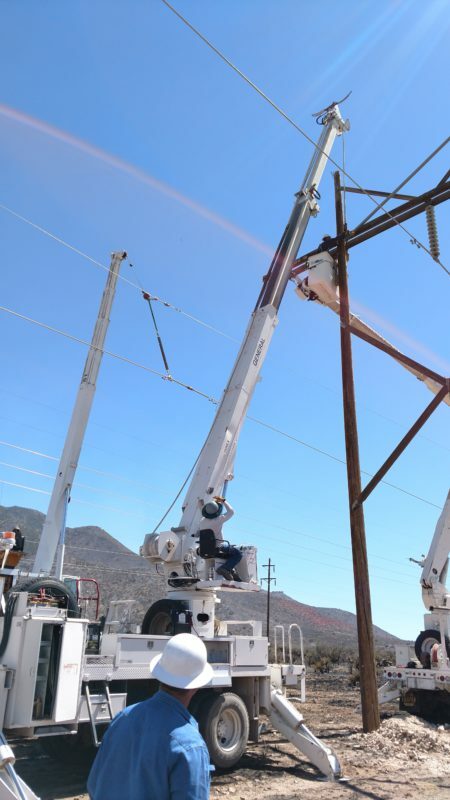 Simply putting it that way doesn’t begin to describe the work involved in changing out a damaged structure on a hot 230kV line, but Jackson said there were some things in their favor. “We didn’t have any flames or smoke where we were, and it was fairly level which made it easier,” Jackson said.